Without much publicity or fanfare, Laure de Clermont-Tonnerre has unbridled a most unusual animal-bonding story. More than 100,000 wild mustangs still roam free in the United States. In order to regulate the horse population, the Bureau of Land Management captures several hundred. A few dozen are sent to prisons where they’re broken and trained by inmates, then sold at public auction, often to police departments for border patrol. So as part of his state-mandated social rehabilitation, he’s assigned to an “outdoor maintenance” program. 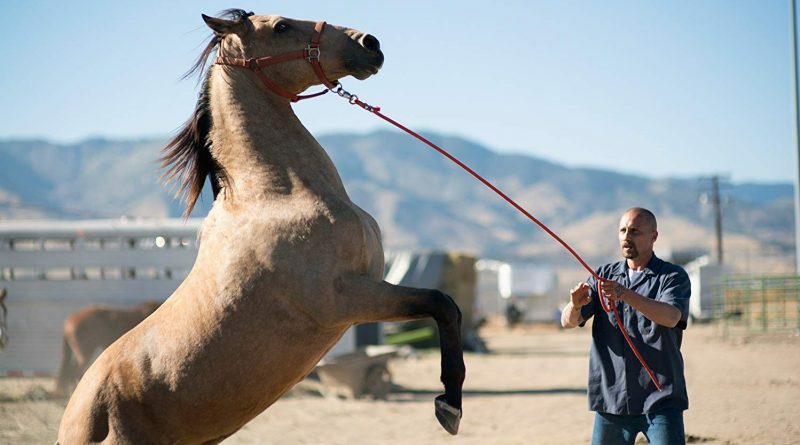 Spotted by veteran trainer Myles (Bruce Dern), a crusty codger, Coleman is accepted into the selective wild horse training section. That’s where he discovers a crazed, seemingly unbreakable stallion. Coleman immediately identifies with the horse’s ferocity and fury and begins to read equestrian magazines. Which leads Coleman into an anger-management session in which the inmates confess that acting on impulse is what led to their imprisonment. Meanwhile, Coleman’s pregnant daughter Martha (Gideon Adlon), from whom he’s been estranged for years, comes to visit, asking him to sign some legal papers. At first, he refuses even to talk with her until, gradually, they begin to communicate. This is French filmmaker Laure de Clermont-Tonnerre’s feature film directorial debut. She developed the equine-therapy concept through Sundance Labs, and Robert Redford is credited as Executive Producer. Trivia: In one scene, Coleman’s cellmate sarcastically calls him “John Wayne.” Bruce Dern murdered Wayne’s character in The Cowboys. On the Granger Movie Gauge of 1 to 10, The Mustang is a meditative, redemptive 8, an enticing tale.